Forget boring brown brick or washed out wooden walls, architecture doesn’t have to be dull. In fact, there’s plenty of places around the world where colour is the main design component. From castles to quaint ski villages, here’s our list of places around the world where you’ll find communities that make the most of the colours of the rainbow. 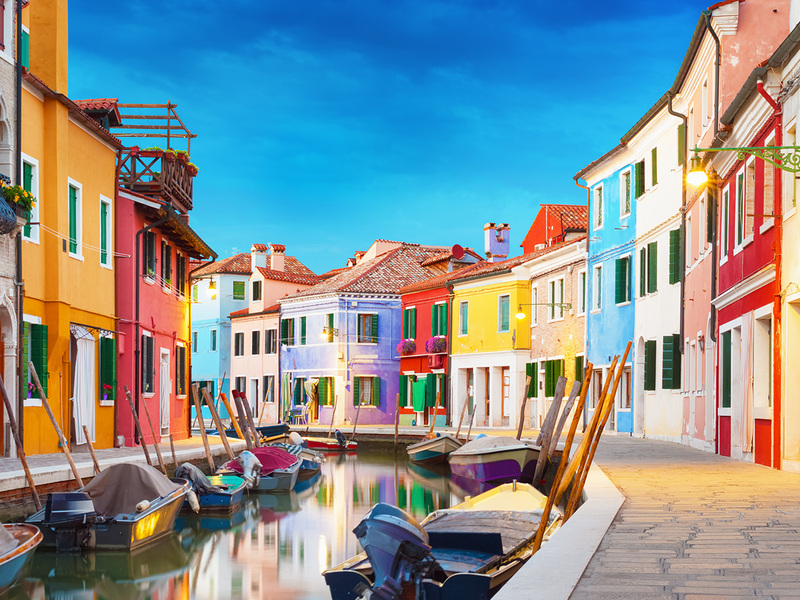 Officially “an island of Venice”, Burano is often forgotten by travellers who take time to visit the more famous Murano Island. They are all missing out. Burano is only a 40 minute vaporetti ride from Venice but a world away from the maze-like streets and the myriad of tourist attractions. The small community is famous for its brightly coloured houses, which sit on wide footpaths in front of the canals. Bright pink, blue, red, yellow or, tall, short, straight, leaning, old new – each house is a different colour, shape and size. They should clash but instead they’re charming. The island’s residents are also famous for their delicate lace work so remember to pop into a workshop while you’re there. If you’re a fan of smaller islands away from the hustle and bustle, book into the exclusive and freshly renovated St Regis Venice San Clemente Palace, located on its own private island. Old meets new in this French-Canadian city. Montreal is famous for many of its modern monuments – the Olympic Stadium’s observatory is a feat of engineering in itself – but it’s the old terrace buildings that have real charm. 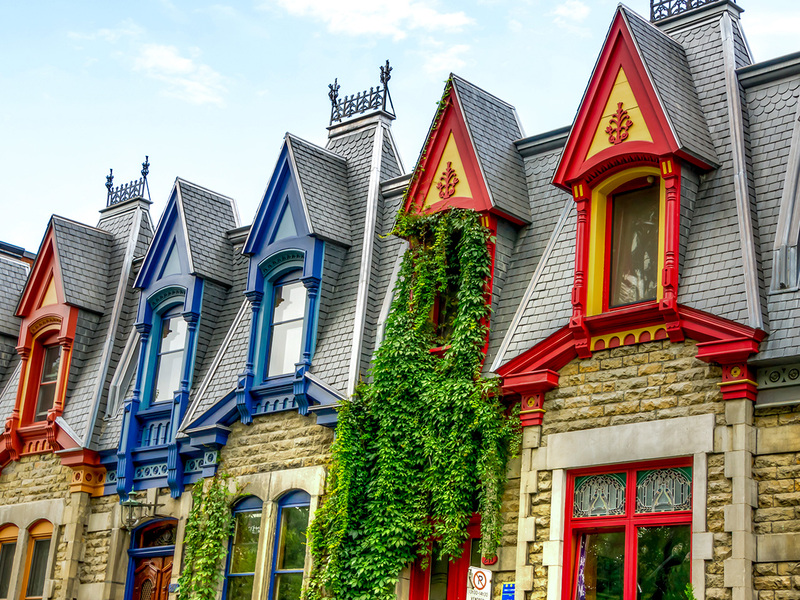 Make a beeline for Le Plateau Mont Royal, a suburb in the north east of the city that’s famous for its brightly coloured terrace houses. Expect eaves in vibrant reds, purples and blues, with wrought iron staircases. Most city tour buses will take you down a few of the more colourful streets but if you have time, explore the bohemian suburb on foot to get a real sense of the artist community. For a bit of history, check into Fairmont’s The Queen Elizabeth hotel, which dates back to 1958. If you’re after a bit of natual colour, time your visit with the Fall (Autumn) when the leaves change colour. Located 500km inland from the Pacific Ocean, and a five hour drive north east from Vancouver, this old-town ski resort is governed by very charming city “laws”. Constructed to resemble a 1900’s mining village, the resort’s buildings must have at leave five colours in their design scheme. The brightly coloured ski shops, candy stores and ye olde themed bars are capped with fresh white snow and certainly capture that old town charm. The car-free community swells in winter, when the 1240 hectares of terrain becomes a ski playground. While the town of Sintra may not be full of too many bright buildings, its iconic palace has enough colour to put it on the list. The UNESCO Heritage-listed region sits in the mountains to the north west of Lisbon, and high on the hill is the Pena National Palace. Dating back to the 1840s, many of the palace’s façade is a shocking shade of yellow. There’s also a bright red tower and plenty of elaborately decorated ceramic tiles. Walking through the extravagant interiors and out onto the parapets, it seems the entire structure is decorated inside and out. Minimalists might want to go elsewhere. The beautiful Tivoli Palácio de Seteais hotel is a great spot to spend the night. You wouldn’t expect the city that celebrates Carnivale so spectacularly to be cookie cutter and this beautiful city lives up to its fun loving reputation. From graffiti art on the street to the buildings around town, everything has a bit of colour and creativity. Back from the famous beaches, the suburb of Santa Teresa is well known for its bohemian vibe. City tours often do a drive by past the colourful apartment buildings and houses where artists, writers and musicians have flocked since the 60s. Once you’ve spent some time exploring, head back to the beach for sundowners at the Sofitel Rio de Janeiro Copacabana.